The wildebeest migration is often punted as the “greatest show on earth”. Also known as one of the Seven New Wonders of the World. It doesn’t have a simple start or end, just a dynamic cycle of wild movement through the year. It’s never the same each year either. Not very predictable but easy enough to witness if you plan around some key points. People usually refer to this as the serengeti migration, but you can also see it on the Masai Mara in Kenya. You can also read more about Tanzania’s Serengeti or Kenya’s Masai Mara. The best times to see the migration are between December and March or between May and November. The migration is largely driven by the rains. Just remember that the rains are unpredictable so the wildebeest migration doesn’t operate on a set schedule. It also doesn’t follow a set route. Nor do the animals all go the same way. This is part of what makes the migration sightings so spectacular. Hundreds of thousands of animals following different routes to the same destination spread across the vast plains as far as the eye can see. The migration leaves the Mara. It moves quickly down the Loliondo boundary. Rains have started. Fresh grass covers the plains. Settled in the short grass lands on the southern plains. Game moves into the Ngorongoro Crater. Zebra are foaling. Over 2 million wildebeest, zebra, gazelles, eland and predators are in the Serengeti plains. Wildebeest are dropping foals. The heavy rains are approaching and the short grass plains are starting to take strain. The migration starts moving slowly through woodlands towards the western corridor as the long or heavy rains set in. The migration follows the Mbalageti river towards the Grumeti. Long grass plains and woodlands provide food. Rains are ending as the dry season approaches. The Grumeti crocodiles enjoy their annual feast. The migration moves north east through the Grumeti towards the Ikorongo . Some move towards the Lobo area. Most of the migration is in the Ikorongo area where the Mara is crossed. The migration moves into the Mara in search of water and fresh grazing. The Serengeti is near the end of the dry season, water is available in the Masai Mara. The migration starts moving south as the new seasons rains start. The migration itself involves around 1.5 million wildebeest, gazelle and zebra, always on the move. Generally in a great clockwise sweep around the larger Serengeti ecosystem. Resident game (predators and other mammals) are generally fixed to territorial areas. Predators don’t follow the great herds much beyond their home ranges. If you’re interested in seeing specific resident game species (eg, elephant, wild dog, leopard, etc) then destinations other than the Mara or Serengeti could be better. When the migration is “on”during high season, you’ll find that the best space gets sold out quickly, so book early to get the best availability and reasonable prices. The variables are rain and grazing through the seasons plus a few physical barriers. Refer to the maps. 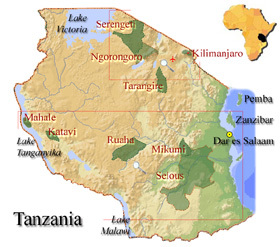 Outlines of Kenya and Tanzania. Then the larger Serengeti Ecosystem map. Note the Serengeti Plains in the south. The western corridor in the west. The Lobo Hills in the north. Seronera in the centre. The Masai Mara is in the far north of the Serengeti-Mara ecosystem. Tanzania’s Serengeti in the south. Let’s start the annual cycle with the “short” and light rains in November and December (sometimes as early as October). The rains fall on fertile volcanic soils which are remnant of the volcanoes in the southern Ngorongoro Conservation Area. The result is short sweet grass which draws the migration rapidly south from Kenya’s Masai Mara. The migration moves down the eastern side of Tanzania’s Serengeti into these sweet short-grass plains. The wildebeest settle in the southern plains between January and April as there’s lots of food. In late March or April and May the “long” or heavy rains set in. The depleted southern plains are less attractive than the long grass plains up in the western corridor. As a result the wildebeest migration moves north westerly. Large river crossings on the Grumeti and Mara Rivers occur as the migration heads back north towards the Mara. The season dries out and fresh grazing and water can be found in the far north. The Mara is usually at its best in August, September and October especially when it’s very dry. Fresh rains start building around October into November. The migration gets restless as it anticipates the change in season. It moves north and south and back again. This is when we usually get the best river crossing action. The cycle starts again when the short rains break and result in fresh sweet grass in the southern Serengeti plains. The wildebeest migration moves rapidly south. How the migration really works! The theory is simple. Seasonal rains and the availability of grazing determines the “clockwise” movement of the migration. 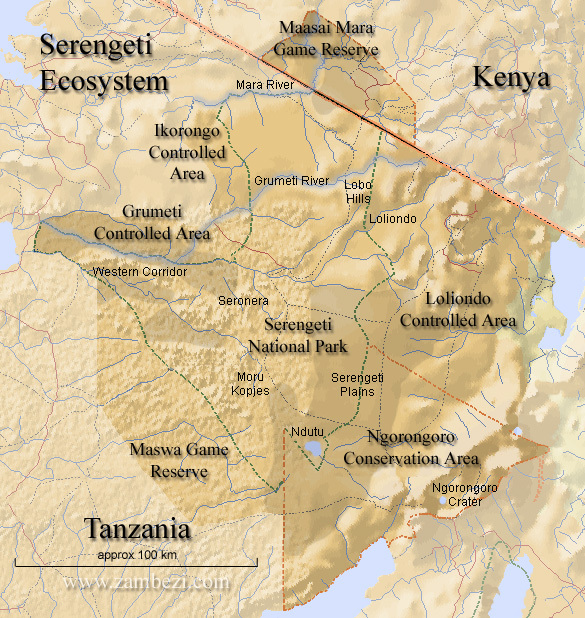 The larger eco-system includes Tanzania’s Serengeti and Kenya’s Masai Mara. A few physical barriers like the Simiti and Lobo hills, the Grumeti and Mara rivers hinder and alter this “circular” path. Well in reality it’s not quite that simple! Here’re some notes gleaned from Richard Knocker. One of the original Nomad Guides in East Africa. The wildebeest want to be in the short grass plains of the southern Serengeti. That’s near Ndutu, Gol and Southern Loliondo, but the water and grazing cannot support them all year round. This is where they choose to give birth to their young with rich grass to support them. That’s usually February and March. Within a short space of time, perhaps 4 to 6 weeks, several hundred thousand calves are born. This is where and when we see much of the dramatic predator action. The wildebeest migration moves off in search of sustenance in response to periods of dry weather. They leave this sweet area as late as possible and come back as soon as they can. But the rains are unpredictable. So every year is different and, in fact, every week can be different. The migration is also not a continually forward motion. They go forward, back and to the sides, they mill around, they split up, they join forces, they walk in a line, they spread out, they hang around. You can never predict with certainty where they will be. So, soon after the short rains start we expect the migration to be in the sweet grass plains area around Naabi, Ndutu and Gol. That’s from December through to April. Depending on local rainfall, they might be anywhere from Moru Kopjes through to the slopes of Ngorongoro. From May, the rains stop and the herds gradually start moving. Usually as the plains of the south and east dry out, there is a movement to the north and west. That’s because there’s more grass and more dependable water. Not all the wildebeest and zebra will follow the same route though. This means that while part of the migration will head to the western corridor and the Grumeti River before heading north, significant numbers may also go up through Loliondo, or via Seronera and Lobo. In a dry year, the first wildebeest could be near the Mara River in early July as this is the only decent permanent water in the ecosystem. In a wet year, as late as mid August. If conditions are very good, with plenty of grass and water the herds will be spread out all the way from Seronera to the Mara River. The wildebeest migration as a whole need not all pass into Kenya. Many stay behind in Tanzania then cross and re-cross the border areas. This carries on through till October into November when they start thinking of heading back. Again this will be dependent on the rains. The Mara river crossings happen at any time during the dry season. But they’re elusive, they happen quickly. They’re unforgettable experiences. The areas that the migration wildebeest covers is vast, even when crossed in a 4WD car. That’s in both the Serengeti and the Mara. Note that there’s more Mara River frontage in Tanzania than there is in Kenya. The migration can criss-cross over the border. People can’t! The migrating groups may be split over a wide area. Finding one on the brink of crossing is not a given. 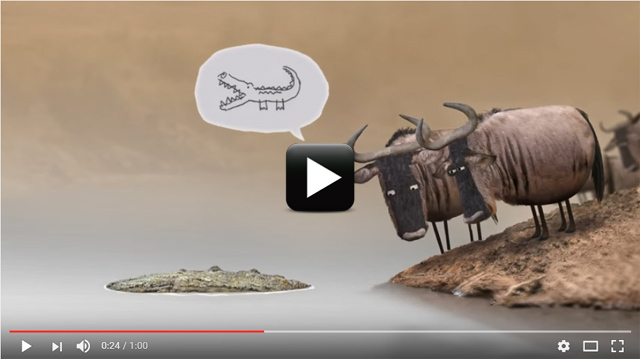 The wildebeest are easily spooked by real or imagined threats. They fear crossing the river, as they have an inkling that something lurks there. Patient waiting near a herd by the river may only produce a puff of dust as they turn on their heels and run away. Or maybe the herd is just not ready to cross the river and they are milling around contentedly. However if everything is right. Then there is utter and extraordinary chaos as the herds struggle to get to the other side of a major river filled with crocodiles. Where’s the best place to see the wildebeest migration? Kenya or Tanzania? Each destination is good at completely different times of the year. The migration is usually active in the Tanzania’s Serengeti for 9 months. It’s most active in Kenya’s Masai Mara for 3 months during August/September/October. If you’re planning a migration safari then decide on either Kenya or Tanzania. Don’t think of combining or switching at the last moment on the cheap. Logistically it’s best to handle the Serengeti from Arusha and the Mara from Nairobi. This will help with decisions on beach breaks on the Kenyan coast or Zanzibar. Or other safaris into southern Tanzania or elsewhere in Kenya. With the exception of a short period during the “long rains” around April/May visitors are always busy looking for the migration. So when the migration is “on”, the right space is at a premium, prices are relatively high and advance bookings are essential. If you’re too late to get the right space when you originally intended it’s better to postpone your safari plans to get the right space. Even if that means a delay for a year. The Mara and Seronera areas have some big hotels and lodges so crowd density can be a problem. These hotels and lodges are generally full even when the migration is happening in a completely different area. The really great thing about these big outfits is that they work to a formula. Same circuits, same timetables to ensure that their tourists “see the migration” then the tourists get fed, watered and to bed in time for the next day’s action. They do it all at the same time too. The trick is to work with smaller outfits with the flexibility and real interest to get out into the bush before the hordes arrive. They’re happy to hold breakfast under a tree when the minibuses are doing their rounds. Then they spend time looking for quieter spots to catch the afternoons and early evenings without crowds. The smaller outfits are a far better bet in both the Serengeti and Mara. Sometimes more expensive but definitely better value for money. What’s the key to a successful migration safari?  People make the real difference on safari. Good professional guides who’re dedicated, experienced and prepared to go out of their way for the better photograph or game encounter are more important than creature comforts. Not that we believe in sacrificing creature comforts but from experience titivating camps and lodges is a quicker and cheaper way of covering up weaknesses in other areas. Employing and retaining the best hosts and guides as part of the team is the bigger and more important challenge for any operator. So when we see rose petals in the bath on safari we ask questions because that’s out of place. When we come across a great guide or host it’s generally safe to assume that the creature comforts have been taken well care of already. Also the price tag is more often than not realistic by comparison with the “veneered” options. A Safari Primer: a recap on African geography and our seasons. Where to go, why and when. Essential reading when planning your first or next safari. Africa’s secret seasons: essential tips on getting your timing right for a migration safari. Safaris in Kenya: a sample of typical Kenya safaris for seeing the Masai Mara at its best and then combining with other highlights in Kenya. Tanzania safaris: a selection of safaris in Tanzania covering the traditional northern circuit, Zanzibar, the Selous and Ruaha, plus the wild wild west of Katavi and Mahale. Special Migration Safaris: Guaranteed solutions for catching the annual migration wildebeest migration with the best guides, areas, wildlife and keenest prices in Tanzania and Kenya. Crocodiles don’t have the biggest brains but wildebeest aren’t the brightest creatures roaming the Serengeti and Mara either. Here gnu meets log whilst migrating across the Mara River, Tanzania.